Honda has spent years working on two science-experiment versions of the Clarity: a fuel-cell car that runs on hydrogen, and an electric car designed to compete with Tesla. The one you’re more likely to see on the road, though — and the one that makes practical sense for more people — is this flavor, the Clarity Plug-in Hybrid. Unlike the fuel-cell and battery versions of the Clarity, which have limited consumer appeal thanks to their shorter range and unusual power sources, the hybrid version comes with a traditional gasoline engine that drives its electric powertrain. That means you can fuel it up at gas stations across America just like a “regular” car. It’s built differently from most gas-powered cars though, starting with its aggressive hybrid drivetrain. Like the Toyota Prius Prime and Chevrolet Volt, the Clarity can run entirely on electric power for a limited amount of time — up to 48 miles in the Clarity’s case. 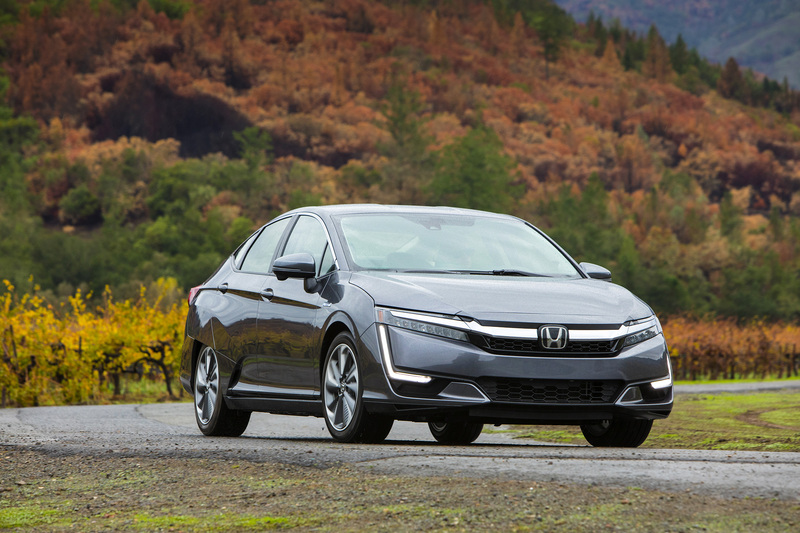 The Honda Clarity Plug-in Hybrid has 48 miles of electric range, one of the best in its class, along with a gasoline engine to keep it going up to 340 miles total. After that point, it can continue to drive using gasoline, giving it a total range of 340 miles between fill-ups. The federal government has blessed it with a rating of 110 MPGe, or miles per gallon equivalent, in combined city and highway driving. For efficiency that extraordinary, the Clarity looks and drives mundane, a compliment in a class known for its occasional oddball styling and flimsy, lightweight-to-a-fault construction. From a design standpoint, the Clarity mixes a hint of futurism — harsh angles and sweeping curves — with Honda’s more conservative visual language. The result is a car that catches your eye but doesn’t scream “hybrid” like a Prius does. This hybrid is much more about performance than appearance. Because it was engineered to be an electric car from the start, its design maximizes space while minimizing weight. Its body structure is 15% lighter than conventional vehicles, Honda claims, thanks to ultra-high-strength steel, aluminum and glass fiber reinforced plastic in the front and rear. Acceleration is always adequate, whether merging onto a freeway or pulling away from stoplights. Power delivery feels seamless even as it shifts between its three distinct ways of moving — under purely electric power, with the engine and motors at the same time, and in engine-drive mode at medium to high speeds. You can see the power routing through a digital display in the car, but you can’t necessarily feel the difference as you’re driving along. The one exception is engine noise. At high RPMs, the engine can sound loud and grating, but fortunately it only persists for short periods when pressing the throttle to the floor. Cruising at highway speeds, the Clarity nicely insulates the cabin from road, wind and engine sounds. The Clarity’s cabin is impressively spacious and comfortable thanks to its smooth ride and Accord-like dimensions. In fact, the biggest surprise during my week behind the wheel was this car’s comfort level for highway driving. With around 193 inches in length and a wheelbase of roughly 103 inches, the Clarity is surprisingly close to the spacious Accord’s dimensions. The Clarity is available with today’s typical safety features, including automatic emergency braking, lane-keeping steering and adaptive cruise control. Instead of blind-spot sensors, the Clarity comes with the Honda LaneWatch camera that gives a wide angle view from the passenger side of the car. Personally, I wish this camera came in addition to the blind-spot sensors, not as a replacement for them. Pricing starts at $33,400 for the Clarity Plug-In Hybrid. The Touring trim, which comes with leather, navigation and the ability to pre-condition the cabin by remote control, starts at $36,600. It runs on electric power for up to 48 miles, but a gasoline engine eliminates the range-anxiety worries of an electric car by extending its total range to 340 miles between fill-ups.